Thinking about building a pole barn? Get a quote from us to compare! Many of our customers come back and tell us our metal buildings are the more affordable option. We offer just about any size metal building you can think of. Carports, enclosed buildings, and agricultural lean-tos, horse run-ins, and more. We have an on-site display of nine carports and our knowledgeable sales staff can help you choose whats best for your needs. We are proud to sell Allsteel Carports. 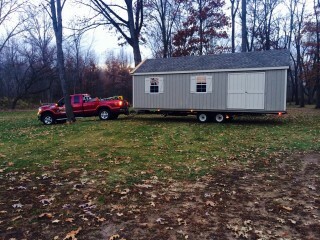 Being Allsteel’s largest Michigan dealer, we at Jim’s Amish Structures are able to make sure our customers are 100% satisfied. 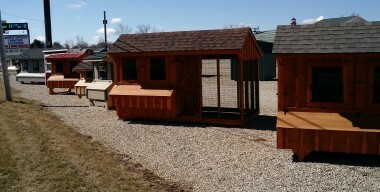 You will be able to see first hand what you will be getting as seen on our 9 display models here at our location. One of our trained people on staff will be happy to walk you through all the different options and make sure you get exactly what you are after for the best price. Base is always 1 foot less than roof size. 11% Places the order and units are installed within two weeks. 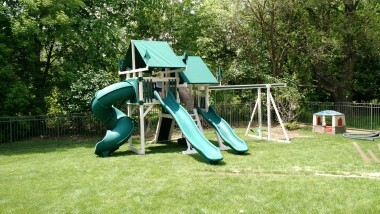 Prices include installation. 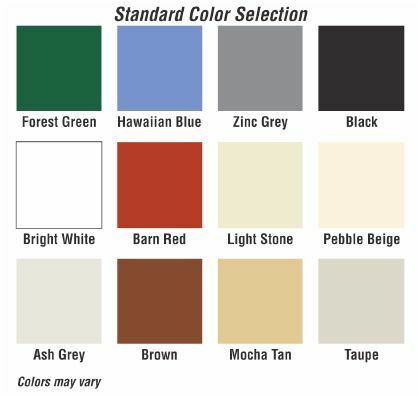 Here are the color selections we offer. When ordering specify roof, siding, and trim color.